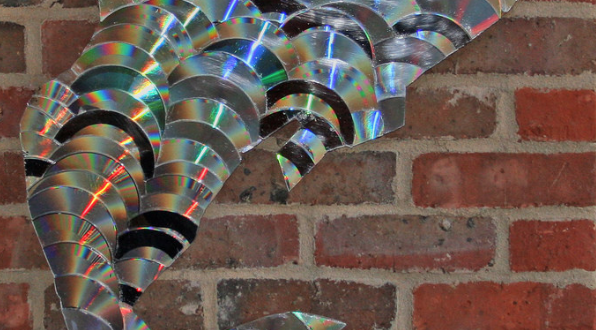 A fish wall art made of CDs. Upcycling: The process of using discarded objects to create something useful and of greater value. Popular upcycling ideas that may come to mind include plastic bottle planters, rubber tire seats, and tote bags made from old jeans. Although upcycling might just seem like a fun home project, it actually helps the environment by saving items from the garbage. Upcycling items is also better than recycling, as the process of recycling requires energy and water. In addition, not all objects are easy to be recycled. But besides helping Mother Earth, upcycling also gives a sense of accomplishment and a reward for yourself. Turning nothing into something is truly a creative talent! Here are 4 ideas to make the “trash” around your home into a treasure! Cut your empty lotion bottles into cute pencil or phone holders. Nearly 29 million tons of plastic go to landfills in the US, excluding the portion that ends up elsewhere (i.e. the ocean). This includes bottles of lotion, shampoo, conditioner, and body wash. However, most of these bottles can actually be recycled. Check the bottom of the bottle for the recycling symbol! Hot-glue some jute string around a plain cardboard box. Turn your brown and boring cardboard boxes into a beachy-style box for towels, toilet paper rolls, or basically anything! But, if you’re not going to use your cardboard for a home project, be sure to recycle it. Currently, the average American uses seven trees per year in cardboard and paper. So believe it or not, recycling does make a big difference. Also, it actually takes 25% less energy to recycle cardboard than to make new cardboard. 3) Paint your empty plastic cans and buckets to transform them into decorative vases or pots. Plastic pollution is a huge problem in our society. The most effective solution is to avoid plastic whenever possible. Even recycling does not cut it. Only about 50% of plastics put in the recycling bin is actually recycled because people make the mistake of putting unrecyclable materials into these bins. According to The Economist, only 9% of the world’s plastics is recycled. It is also widely known that plastic takes a long time to decompose. So, whether you have recycled all your plastics or not, it is still somewhere on our planet. 4) Create a beautiful mosaic with old CDs. CDs and DVDs can not be put into your normal recycling bin because they are #7 plastics (polycarbonate). Most people do not give the extra effort to ensure that their discs are actually recycled. Instead, millions of CDs and DVDs end up in landfills. So do something cool with your discs!